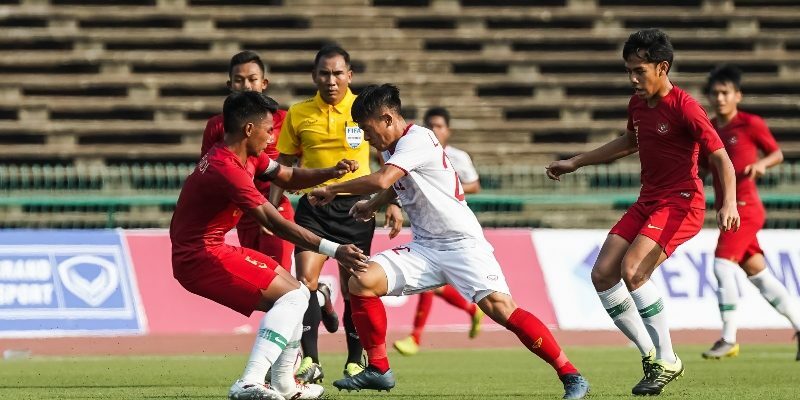 PHNOM PENH (24 Feb 2019) – A well-taken freekick from Muhammad Luthfi Kamal Baharsyah gave Indonesia their place in the final of the AFF Under-22 LG Cup 2019 following their close 1-0 win over Vietnam in the first semifinal this afternoon at the National Olympic Stadium. The game was all even way past the hour mark before Luthfi strode in with the freekick in the second half to send their partisan Indonesian fans into celebration. The afternoon heat and given the nature of the game forced both teams into a more defensive stance as they were not willing to commit too much into offensive play. And with the battle fought mostly at the centre of the park, Vietnam had their first real chance in the 25th minute but for the excellent work of Indonesian custodian Awan Setho Raharjo to deny Phan Thanh Hau. Indonesia replied with two chances before the break off Bagas Adi Nugroho and also Sani Riski Fauzi but neither could make them count. Striker Marinus Manewar almost gave Indonesia the lead just a minute into the second half but Vietnam keeper Phan Van Bieu was on hand to force the ball out of play. As the game wore on and as Vietnam seemed content to sit back, a freekick for Indonesia saw Muhammad Luthfi delivering an exquisite shot past Van Bieu. That goal cajoled Vietnam into action as they fought for more of the possession to force Indonesia into defensive mode. But then, not even with five minutes of added time could change the inevitable as Indonesia celebrate their entry into the final this year.